Where am I? Home News	Summa Print Finishing Solutions and New Products at Sign &amp; Digital 2013! Summa and UK Distributor ArtSystems team up on Stand M13 to debut a range of print finishing and vinyl hardware products not yet seen in the UK. These include the new S Class 2 T Series vinyl cutter range and the new Pneumatic Oscillating Tool for the Summa F series flatbed cutter. 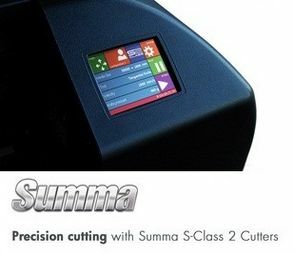 With advanced computer-controlled blade rotation and up to 600 grams of cutting force, the S Class 2 T Series cuts better and deeper than any other cutter in their class. Thanks to its genuine tangential cutting head it has the cutting precision of a flatbed while having the ease and high-speed of a roll-fed cutter. The new Pneumatic Oscillating Tool for the F Series is designed to offer the power for cutting through dense, tough or thicker material and gets its UK debut at the show. In addition to the hardware there will also be the Arden Impact software range; a new applications software for 3D packaging and POS design and production. Incorporating a comprehensive range of interactive drawing tools, an extensive library of reusable POS display templates and the packaging industry's most powerful virtual 3D sampling features. Impact is the ideal partner to the Summa F Series, turning it into a short run or prototype production solution to this expanding market. Summa's excellent reputation for manufacturing quality is now also combined with innovative technology to take print finishing and cutting forward. In particular the new S Class 2 series is designed to directly meet the latest requirements in the Sign- making market. We want to give our customers an opportunity to see first-hand why investing in Summa machines can give back profitability and business growth.